Last week, one of the guys on my hockey team asked me for some tips on hockey tournament recovery. This was highly relevant since we have a tournament this weekend! And, it’s a great question. After all, we will be playing 3-4 games over a very short period of time. Having a strategy to recover between games, especially on the day we play two games, will help us perform better and reduce the risk of injury. Both great things! 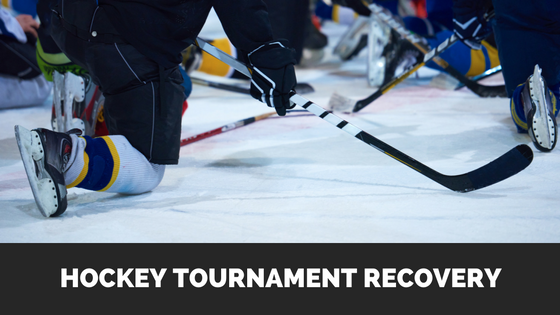 In this article, I will outline my three key principles for hockey tournament recovery and outline what my plan will be for the Saturday where we play a morning game and an afternoon game. It’s no secret: when we play hockey, we sweat. A lot. And when that happens, we need to replenish the water we lose. It’s estimated that a hockey player can lose 1-2lbs of water during a game. For goalies, it can be even more. To replace that water, you need to drink about 750ml per pound lost. Staying hydrated during a tournament is really important. Water allows your muscles and organs to work properly. And, it is a vital part of your body’s ability to move nutrients to where they are needed and take waste away from where it’s not wanted. In other words, it will help you recover faster for the next game! 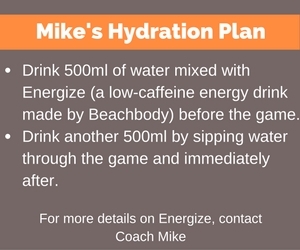 To stay hydrated, start by making sure you’re drinking water well in advance of the game. During the game, you want to be sipping water in between shifts. And then drink even more water after the game. And sorry, but locker room beers won’t help you (in fact, it will make things worse!). Proper nutrition during a hockey tournament can be tricky. 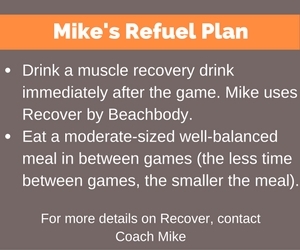 Between beer in the locker room and your teammates wanting to go get pizza or chicken wings after the game, it can be hard to refuel properly. And refuelling is important – you need to replenish your body’s energy stores! One thing that you can focus on is providing your body with some sort of recovery drink. This drink should contain a good amount of protein and some carbs. There are many workout recovery drinks on the market. Read the labels and do your research before you buy! And, look for NSF certification – it guarantees the ingredient label is correct and there are no substances in the container that shouldn’t be there. As an easy alternative, have some chocolate milk. Studies have shown that it can be a pretty good recovery drink due to its mix of carbohydrates and protein. If you’re playing more than one game on the same day, you will also need to plan your meals carefully. Try to eat a balance of carbs and protein. A good example of a pre-game meal would be grilled chicken, steamed veggies, and some rice or quinoa. Also remember to not eat a large meal too soon before a game. Give yourself between 2 and 4 hours between your meal and your next game. A note on alcohol: try to avoid it. I know that’s asking a lot during a tournament! Alcohol will take away from your efforts to re-hydrate. It also interferes with your body’s ability to synthesize protein, which means that recovery drink will be less effective in repairing your muscles. If you’re a fan of watching hockey, and the after-game interviews, then you may have seen players on exercise bikes right after getting off the ice. Why? Because high-intensity exercise causes a buildup of waste on your muscles. Spending some time doing low-intensity exercise will help your body get rid of that waste. It can also help with reducing inflammation and reduce the possibility of muscle soreness and stiffness later on. Keep these three principles in mind for your next hockey tournament, and remember to keep your stick on the ice!